Companies are gathering data from their customers at unheard of rates thanks to the advent of high-speed connectivity and smart devices. Whether it is the personal details that customers provide when they register for a service or the data points that are collected through a customer’s transaction history (including purchasing habits and location) to information on friends, family and hobbies shared with and through social networks like Facebook, YouTube, Twitter – companies hold unprecedented amounts of information about their customers. These customers, in turn, trust those organisations to use that data in ethical fashion – not to sell it to third-parties and to keep it safe from theft or abuse – what is becoming known as ‘digital trust’. 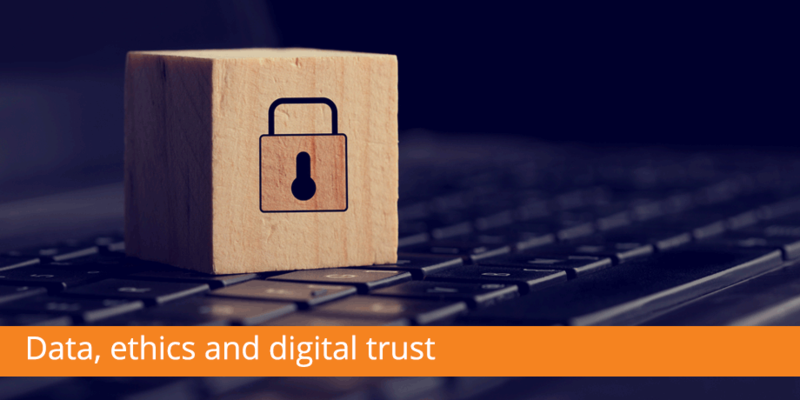 To build digital trust, organisations need to convince consumers that they can and will protect the data in their systems, and not use it in a way that contravenes the spirit of how their customers’ would want it to be used. People have become more aware of the value of their digital identities, partly thanks to an increased incidence of data breaches and identity theft and are increasingly starting to act to protect themselves by asking companies what they need information for, whether it will be stored (and if so, how) and how it will be used. In order to gain the trust of their current and future customers, companies will need to define a data ethics code, publically commit to it and then stick to it. The millions of data points an average consumer generates while buying, banking, spending, downloading, sharing, registering online can be leveraged to provide a picture of the buying patterns and interests of a consumer, and used by organisations to further their commercial objectives. As a service provider, however, you need permission to do this. In the initial phase of a digital relationship, it’s imperative that a business not only gets permission to communicate digitally, but also defines how it may use given, gathered or derived data and the benefits or purpose of doing so. From an organisation’s perspective, the increasing connectedness of everything will enable true one-to one-communication, resulting in more relevant marketing messages and less wasted time and energy in engaging customers, and selling more services. This increasing connectedness comes with risks, however. According to an Accenture global survey of more than 3 100 business and IT executives across 11 countries (October – Dec 2015), 82% said that trust is the cornerstone of every business in the digital economy, and 83% agree that data ethics breaches pose a similar threat to security breaches. And this is where the digital trust comes in, if you breach that trust, that consent will be revoked and you’ll lose the customer.